What does this mean? If there is improvement and the Fed believes it can be sustained, then they may reduce the amount purchased. This is as clear as mud. The market reaction was swift. Equities feel so investors do not believe that the economy can run on own at current growth rates. There was more information from the market than from Ben Bernanke. The big fear this spring was the poor corn planting. Planting was not happening fast enough given the cold wet weather. Yet when the weather turned, the corn seeds went into the ground at a rate faster than anyone anticipated. On May 3rd only 12 percent was planted. By the 10th, 28 percent was planted and then the report for May 17 came out and the eye-popping number of 71% was reached. The new number this week may be closer to 90%. The farmers got up early and planted like there was no tomorrow. The reason for this strong number is that many farmers are now using better tractor technology and 36 row planters versus the normal 12 and 18 row planters. With GPS and large planter, you can get mor ein the ground if you have dry weather. The planting problem has been averted so now the market can move on to other growing risks. The focus will also be on demand and how the old crop will move off the farm. Farmland - is there value? The farmland rental rate has slowed over the last 12 months with the decline corn prices. The rental rate is still moving upward but momentum is down so the frenzy of the last two years has fallen. This comes from an Iowa State survey which showed a 7% increase in the last year versus 18% in 2012 and 16% in 2011. The Kansas City Federal Reserve said irrigated cropland in its district rose 30% in 2012, while the Chicago Fed reported a 16% increase. And despite the drought in Iowa last year, farmland prices have nearly doubled since 2009 to an average of $8,296 an acre. Prices in Nebraska have also doubled during the same period. Robert Shiller, professor at Yale, and the master of bubble research has also commented that farmland may be in or facing a price bubble. The supply is tight and low interest rates have allowed for more speculative behavior. If there is a strong decline corn prices this year, we could see farmland price fall this year. This is an llliquid asset, so investors should be cautious about purchases at this time. Value could be limited. A very interesting risk is being faced by corn traders - the race against time to plant. With poor spring weather the planting of this year's corn crop has been delayed. As of the most recent report, only 28% of the crop has been planted. The average for the last five years has been 65% and last year the amount planted by this time was 85%. What makes this so critical is that after May 20th, the number of growing days will be potentially curtailed and the yield per acre will decline. 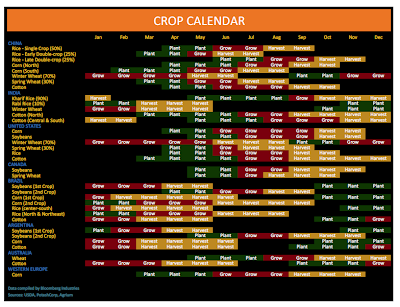 The farmer's rule of thumb is that you lose 1 bushel per acre for every day of planting delay after May 20th. 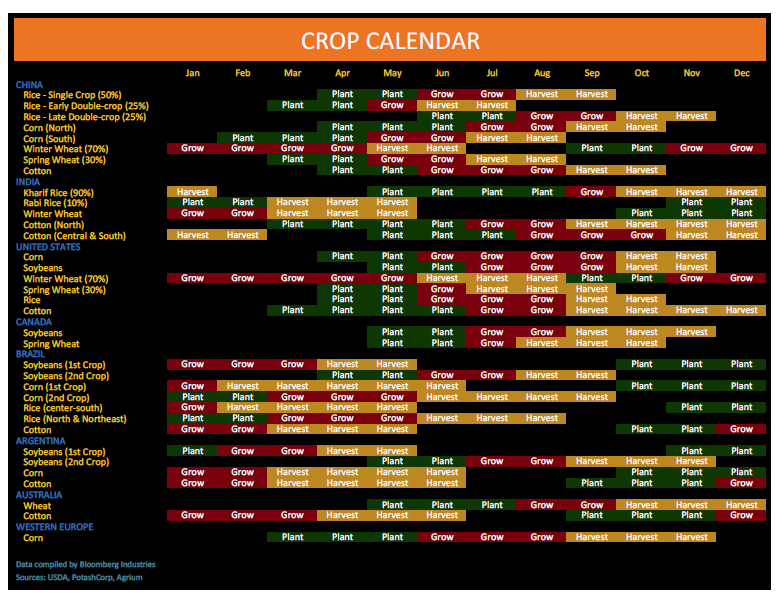 Additionally, the key pollination period will move to later in the summer which will also affect the yield if there is a hot period at this critical time. Hence, there is a race against time to reach for potential maximum yield. Very few markets face this type of risk. 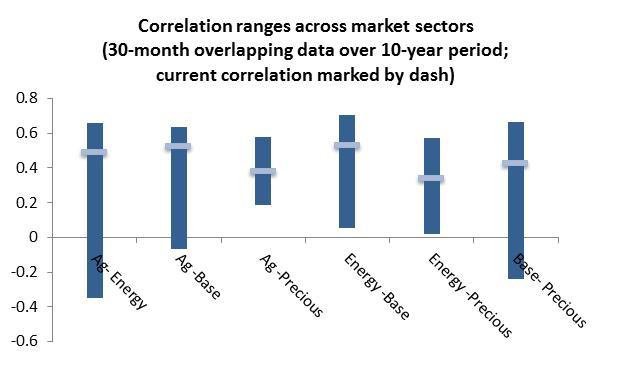 The correlation across sectors within the commodity asset class have started to fall. They are still not near their medians but these correlations have started to come down and suggests that commodity sectors are being driven by the local supply and demand effects within the markets. The chart shows the overlapping 30 month correlation between sectors for the last 10 years. The hash marks represent the current levels. 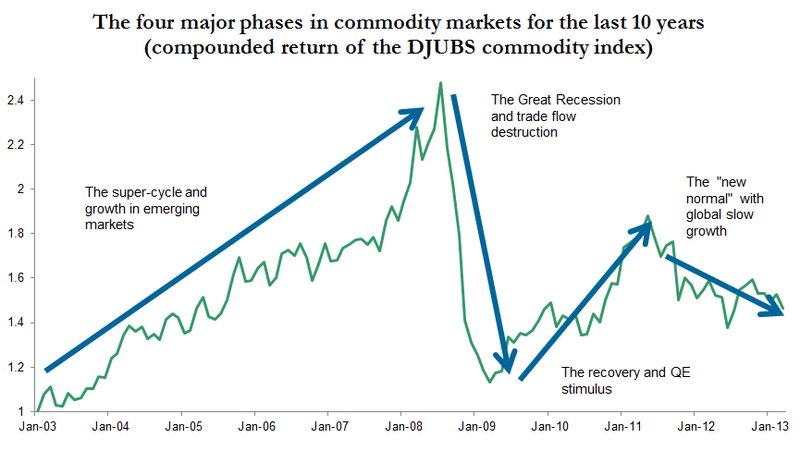 Correlation between the equity markets and commodity markets also have fallen significantly. 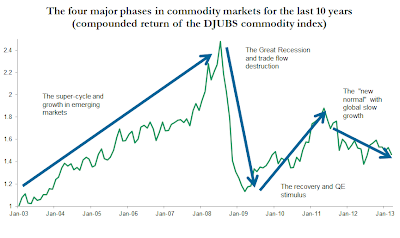 We have moved from very high positive correlation which for the DJUBS commodity index and the S&P 500 was above .8 to now a negative .7. This has been a frustration for many investors, but the futures market seem to be more closely linked to the real economy and not to financial assets. 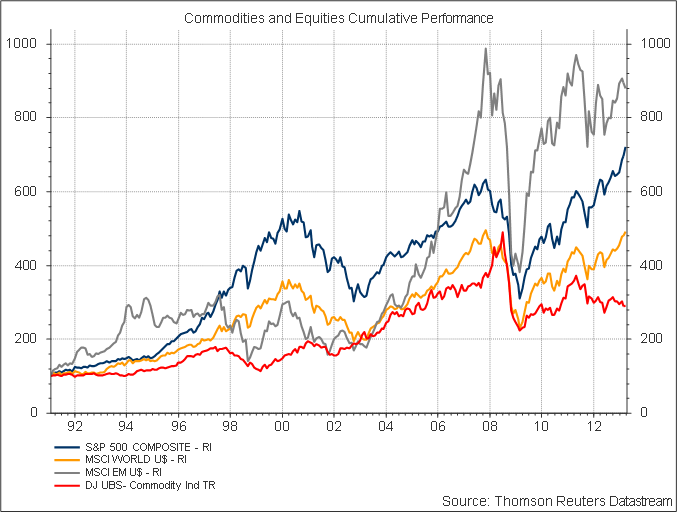 There is now more diversification with holding commodities than we have seen in the past. The cost has been return. 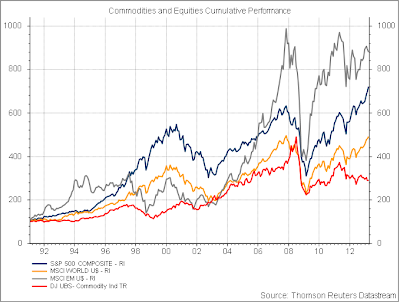 The volatility of commodities have also fallen in response to the fall in correlations within the commodity sectors. This will be a continuing theme in the commodity markets. Note, for example that the correlation between ag and energy markets has at times been negative. The same applies to base and precious metals. Most of the correlation across sectors are well below .5. Commodities as an asset class just do not move closely together. Interesting stat form Bank of America - there have been 511 rate cuts around the world since June 2007. The surge of liquidity has not abated after five years, yet there is limited inflation in the G7. In fact, inflation has been going down not up. Emerging market inflation is higher but well under control versus historical levels. There is no value in bonds because governments do not want them to have value. Talk of the Great Rotation to equities has risen and fallen since the beginning of the year. Much of this change in sentiment is based on the investment public not truly accepting that governments have only one policy choice that they like - cutting rates. The commodity markets can be divided into four phases over the last ten years. Phase I was the super cycle period from 2003 until June of 2008. The market hit an extreme based on strong emerging market demand and under supply from a lack of investments in the 1990's. This came to an abrupt stop with the Great Recession. Phase II was the Great Recession period which hit trade flows very hard. An overbought market and a major recession caused a massive overshoot on the downside in commodities. Phase II was the reversal period which matched some of the gains in stock markets as economies started to recover. The combination of quantitative easing and a pick-up in growth created a nice rally in commodities. The rally never got to the old highs since the recovery around the world was not as strong as expected. Phase IV was the link between commodities and the reality that economic growth rates will be lower than in the early 2000's. Global growth is lower. Emerging market growth will be positive but still lower than before. Developed market growth is anemic. Oversupply from investments in energy and mining is having an effect on prices. The result has been a price decline in line with the real economy. Phase V --- ???? The markets may be more micro driven on the fundamentals of supply and demand. We can expect the index to be range bound with some markets having large up or down moves. If growth exceeds expectations, there will be a commodity rally. Reading about observing trees and growth in Spring. These quotes are very apt for the investment world. It is all about seeing what is going on. Do we know the environment we are in? A Bloomberg sample of corporate pension plans shows significant underfunding in the companies within the S&P 500 and Canadian TSX. The median fund shortfall is a little over a half a billion. The median discount rate is 4.15% and the median expected return is 7.28%. Pensions have too high an expected rate of return and to a degree too high a discount rate. The rate should be close to the risk free rate of return if you want to know what the present value of these liabilities will be with some certainty. It is greater that their portfolios will do well this year as evidenced by performance through this week, but there is still a lot of risk in the market and you need significant excess returns to offset the pension shortfall. "the Committee is prepared to increase or reduce the pace of its purchases to maintain appropriate policy accommodation as the outlook for the labor market or inflation changes." The latest FOMC minutes tell us that the Fed wants to have more flexibility to adjust asset purchases. Of course, this increases the amount of uncertainty in the market because we do not know the criteria that will be used to make these changes. Lower unemployment? Higher asset prices? We do not know and this is a critical issue for the markets. Commodity markets more closely follow the real economy and a comparison of equity charts shows the effect. New highs are being reached in equities but the output gap has still not be closed in many economies so commodity prices are not seeing the large run-up. There is no increase in valuations to drive prices higher. There is still snow in the upper Midwest, so planting of corn will come late. Corn needs a specific number of growing degree days to reach maturity. If planting comes late, there is a chance that maturity will not be reached before frost. This will take a bite into the size of the corn corp. It is early to state that there will be a problem but the chance of a crop problem is growing. Agriculture is always a seasonal business and when season change is late there will be problems.